History: (What If? I#37/1) - When the Thing contracted Virus X thanks to MODOK, Giant-Man attempted to remind him how much people depend on him but the Thing, feeling that the Virus might affect his mind and cause a rampage, slapped Giant-Man aside and flew away. As he flew off, he destroyed the communicator in his Sky-Scooter. Alicia Masters soon after contacted Reed Richards, who used his Vapo-Tracker to follow the Thing's fuel trail from the Sky-Scooter. While the remaining Fantastic Four tracked the Thing, Captain America and Giant-Man tracked down MODOK in hopes of finding a cure for the Thing's condition. The Thing's condition continued to worsen as his body mutated to the point where he was no longer able to control his Sky-Scooter, causing him to crash near a cave. Giant-Man soon managed to threaten an A.I.M. member into showing him the cure to Virus X and as he realized that the cure would also cure his radiation poisoning, Giant-Man used it on himself and with Captain America, defeated MODOK. The Fantastic Four eventually found the Thing hiding in a cave, his body radioactive from the mutations. As Reed had expected, the Thing soon exploded in a blast of radioactive energy that not only cured Alicia's blindness but transformed him back into Ben Grimm. Reed and the others immediately transferred Ben back to their headquarters to monitor his condition and days later, Reed revealed that Ben's transformation to normal was permenant. 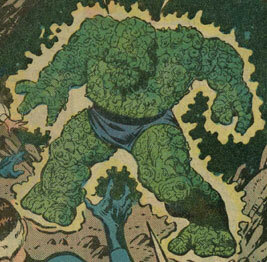 No longer the Thing, Ben proposed to Alicia Masters and the Thing was replaced in the Fantastic Four by Giant-Man. Comments: Created by Tom DeFalco, Arvell Jones, and Sam de la Rosa. The divergent point for this reality occurred during the events seen in Marvel Two-in-One#81 (November, 1981). This reality was given the number Earth-8321 in Marvel Encyclopedia Vol. 6: Fantastic Four. Advanced Idea Mechanics was the same as their Earth-616 counterpart group, made up of the world's leading scientists. They were led by MODOK and often acted as his henchmen. When Captain America and Giant-Man found MODOK, they had to fight their way through an army of A.I.M. agents before they found the cure and threatened MODOK into letting them go free without fight. Captain America was the same as his Earth-616 counterpart. He helped Giant-Man track down MODOK in hopes of finding a cure for the Thing's mutating Virus X. Eventually, Captain America and Giant-Man did find the cure and threatened MODOK into letting them go without a fight. He had peak human physical abilities and longevity, just like his Earth-616 counterpart. Bill Foster was just like his Earth-616 up until the Thing refused to listen to his pep talk concerning Virus X. 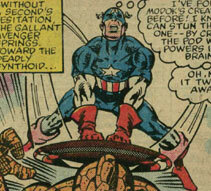 Determined to help the Thing, Giant-Man set out with Captain America to find MODOK and a cure for the Thing's condition. Eventually finding one, Bill discovered that the cure made the patient temporarily invulnerable to radiation, thereby allowing the Virus X to die out. Realizing that it would also cure himself of his radiation poisoning, Bill used the cure on himself and prepared to use the remainder on the Thing until the Thing reverted back to Ben Grimm after exhausting all of the radiation in his body. With the Thing gone, Giant-Man joined the Fantastic Four in his place, hoping that he would learn how to be a true hero in their company. Giant-Man could grow in size at will, like his Earth-616 counterpart. Johnny Storm was the same as his Earth-616 counterpart, being the Fantastic Four's youngest and most hot-headed member. 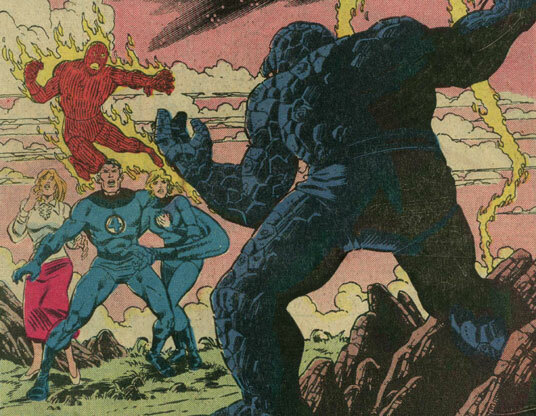 When the Thing ran away in exile, the Human Torch aided the Fantastic Four in finding him. He had the same fire-manipulating abilities that his 616 counterpart had. Sue Richards was the same as her 616 counterpart. She aided Reed and Johnny find the Thing and when the Thing exploded in a blast of radioactive energy, Sue shielded the team from most of the radiation's effects. She was later happy to see that the blast cured Ben Grimm of being the Thing permenantly. Sue could turn invisible and generate invisible force, like her 616 counterpart. Alicia Masters was the same as her Earth-616 up until the Thing ran away in exile. Determined to find him and fearing for his life, Alicia accompanied the other members of the Fantastic Four in locating the Thing. The Thing asked Alicia to get away from him, as he was building radiation in his body. The Thing eventually exploded in a blast of radioactive energy that somehow cured Alicia of her blindness and returned the Thing to his human form. Permenantly human once more, Ben Grimm proposed to Alicia. Reed Richards was the same as his Earth-616 counterpart up until the Thing ran away in exile. Using his Vapo-Tracker device, Reed tracked the fuel trail left by the Thing's Sky-Scooter, eventually finding him in a cave. Just as Reed as suspected, the Thing was absorbing radioactive energy at an alarming rate and would soon explode. As the Thing exploded, Reed and the others were protected by the Invisible Girl's force field. Days later, Reed discovered that the radioactive explosion had drained Ben Grimm of all radiation in his body, leaving him permenantly human. As Ben proposed to Alicia Masters, Reed announced that Ben's replacement in the Fantastic Four would be Giant-Man. Mister Fantastic had stretching powers, just like his 616 counterpart. 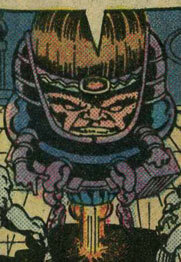 MODOK, like his Earth-616 counterpart, was the genetically mutated leader of A.I.M. During a battle with the Thing, he infected the Thing with Virus X that caused the Thing to mutate uncontrollably while absorbing radiation. Captain America and Giant-Man soon found MODOK and forced him to reveal the location of Virus X's cure. MODOK could project mental energy blasts, like his 616 counterpart. Ben Grimm was the same as his Earth-616 counterpart up until he was infected with Virus X. Continuously mutating, the Thing fled from his friends, afraid that his mind would be affected and that would become a mindless monster. Tracking him down, the Fantastic Four determined that he would soon explode in a blast of radioactive energy which he soon did. The explosion expelled all radiation from Ben's body, transforming him permenantly to his normal human form. Happy that he could finally live a normal life, Ben proposed to Alicia Masters. Originally, the Thing had superhuman strength and durability, like his Earth-616 counterpart, but once he was infected with Virus X, he absorbed radiation that constantly caused him to mutate into more monstrous forms. Once he expelled the radioactive energy, he became completely powerless.